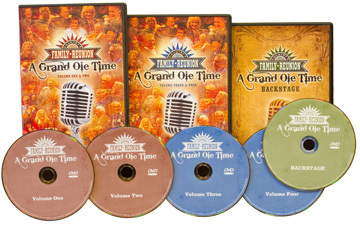 "A Grand Ole Time" includes 5 DVDs with over 7 hours of country music entertainment. Includes the Behind The Scenes DVD. This our brand new Country's Family Reunion Collection offered for the very first time. We have brand new artists joining the fun, singing songs, telling stories, and sharing their hearts. It's a Grand Ole Time you don¹t want to miss! Hosted by Whispering Bill Anderson, some of the artists appearing on Grand Ole Time include: Ricky Skaggs, Dallas Frazier, Collin Ray, Gene Watson, Jack Greene, Johnny Carver, Ronny Robbins, Rhonda Vincent, Moe Bandy, B-J Thomas, Larry Gatlin, Roy Clark, Bobby Bare, Neil McCoy, Don Wayne, Marty Raybon, Jimmy Fortune and MANY more. There are tons of live performances and many wonderful stories from all the guests in attendance. Some of the songs include: "Elvira", "Love, Me", "Southern Loving", "There Goes My Everything", "Take Me As I Am", "There's A Big Wheel", "Americana", "Tie A Yellow Ribbon Round the Old Oak Tree", "I'm So Lonesome I Could Cry", "Then You Can Tell Me Goodbye", "I Wouldn't Change You If I Could", "Streets of Baltimore", "If I Had To Do It All Over Again", "Country Bumpkin", "Weekend Friend", and MANY MORE!! All for just 29.95 plus 6.95 shipping and handling!